This was the “summer look”…. 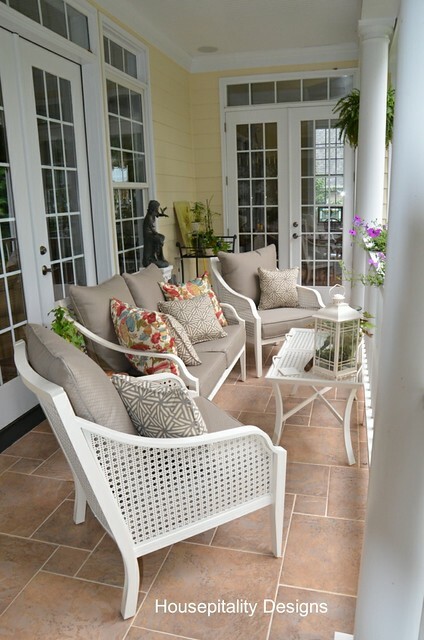 …..you can see the entire summer porch here.. They are so cute with small buttons sewn on the paisley print…. …..and pretty blue “rick rack” trim….I think a great deal for $10.00. …..if my memory serves me correctly, I believe the price was under $10…really!! 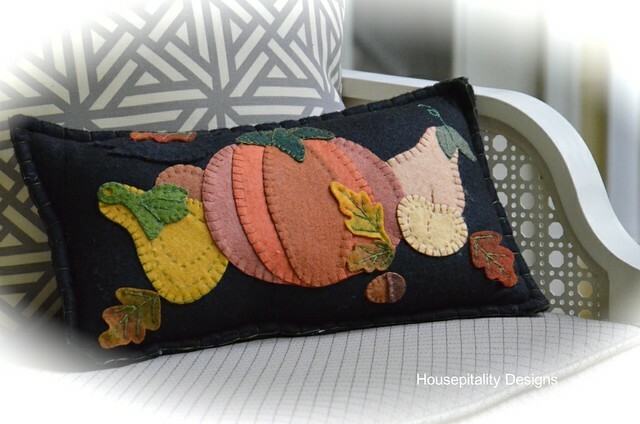 My favorite Fall Pillow….so beautifully handcrafted. 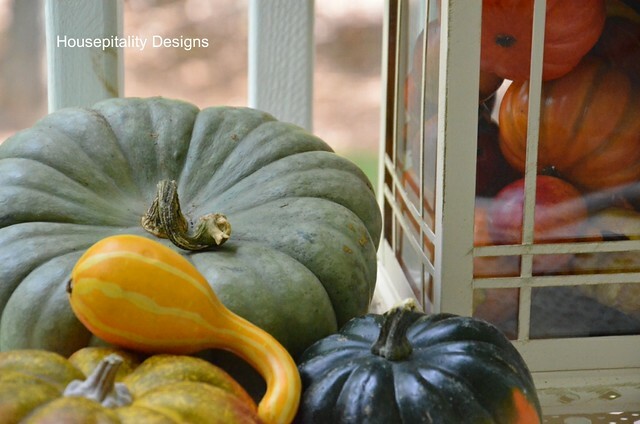 The coffee/tray table dressed with mums, pumpkins and gourds..
…..the Jack-O-Lantern is by Lenox. …..of the Southern Bloggers Conference….filled it with mums. A view from the other side of the porch…. 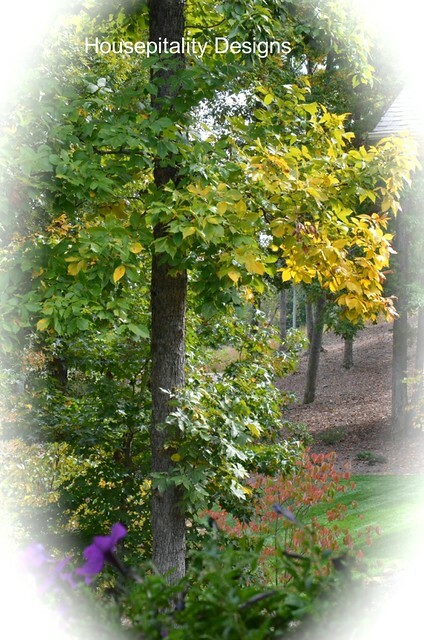 …..maybe we will get an early snowfall…and it will blend in! Note to self…put a drop cloth down before using spray paint!! 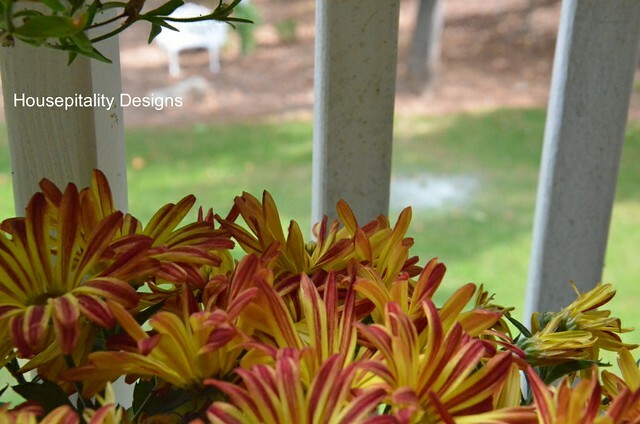 I love to spend time on the little upper porch when the leaves are a masterpiece of color!! I think the very small word, “JOY”…says it all! Hope you are enjoying spending time outdoors enjoying the Fall weather! Shirley, this is lovely! I love your precious pillow with the pumpkin on it- the stitching is wonderful! You found some amazing deals on pillows! The lantern looks great and ready for Fall. Your yard is lovely even with the spray painted spot! I’m ready to sit and enjoy the gorgeous view! Love the look what caught my eye was your chairs and coffee table, they are both beautiful! Are the chairs redone? They remind me of inside chairs from the 80’s with the wicker/woven trim under the armrest. Fell in love with them. I have come across chairs like this in consignment shops and loved them but didn’t know how to refurbish them, after seeing how great yours looked I wondered what paint did your use? Exterior spray paint possibly? Also the coffee table looks like metal, I loved the pattern and looks so good with your chairs! Beautiful colors! I’m glad to see your post here, Shirley. That means your husband actually let you live after that spray paint incident!!! 🙂 🙂 🙂 It will fade soon. Meanwhile you’ll just have to treat your husband to foot rubs and special desserts to keep his mind off of it! 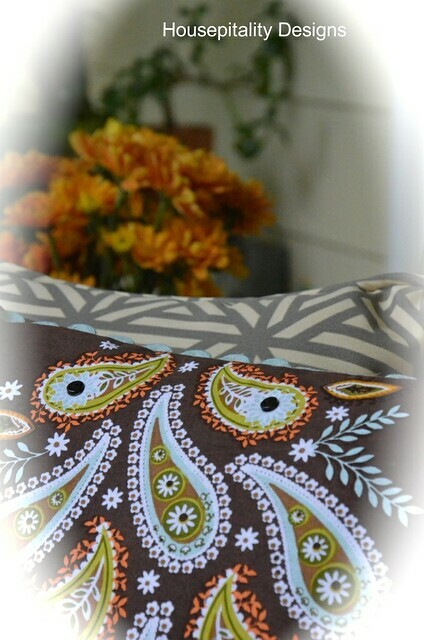 Great transition to fall, and it’s so great that you found accent pillows at such a fabulous price!!! I didn’t even know JoAnn’s had pillows! Score! The lantern is another great score! I just love a bargain!!! Patience really pays off…literally! I’m looking more closely at your windows and door now, and this is kind of what I want to do off of our kitchen & family room. We have a huge double set of windows in the kitchen now, and I’d like to deep six those puppies in favor of French doors. Where there is a smaller window in the kitchen, I would like to put a door, and then I’d like to get rid of the door that’s in the family room. Whew! I don’t ask for much, do I? 🙂 At any rate, I like the way yours is done. Have a great night! I’m going to the airport soon to pick Ramon up from his trip to Vermont. SO glad when he gets back here! Bye! 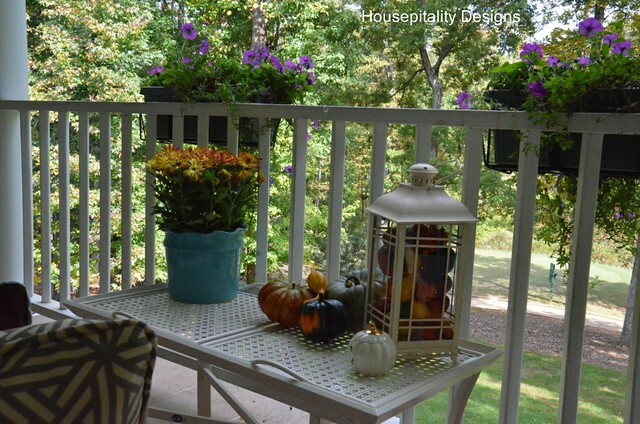 Shirley your porch looks “Great for the fall” I just love your house, especially the back! As for the paint on the grass, take something to remove that section of grass and throw out some grass seed, and a little straw…lol…The canvas letter monograms you have on your front doors, I love too…what size mongram letters did your friend use to monogram them…what a wonderful look to enhance your double doors. Shirley you have a beautiful porch. Love those cane chairs. 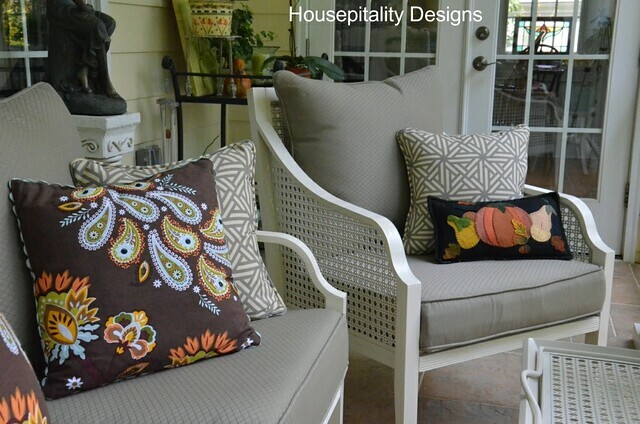 The appliqued pillow is perfect for you porch. Great buys on your purchases. I’d love to come enjoy a cup of tea on your porch, Shirley. All of your fall touches are just perfect! I should have stuck with you when we were thrifting on Sunday – I love the ironstone container that you found. 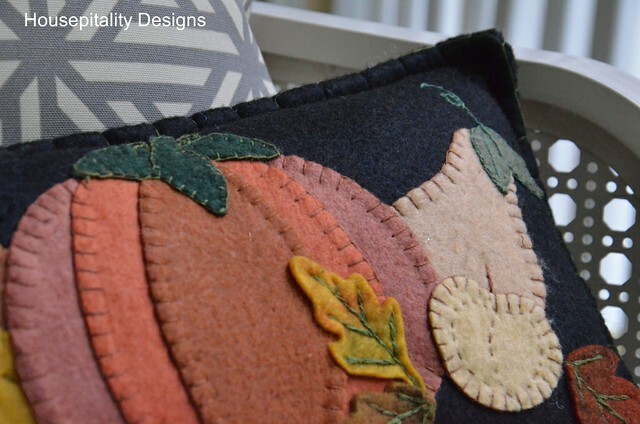 Shirley~ I love your fall pillows from JoAnn’s and your felted pumpkin pillow is adorable! Love the Fall changes. That pillow is just gorgeous and yes it is a work of art. Beautiful. I would love to be sitting out there is this wonderful fall weather. So pretty Shirley!! 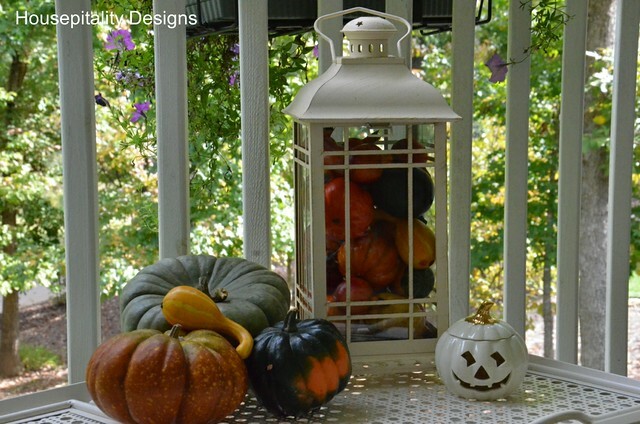 Love your new pillows and I love the lantern filled with pumpkins! I had to laugh at your white spot, because i do that all the time LOL! But once our gardener cuts our grass it’s gone, I wonder what he thinks!?! LOL! 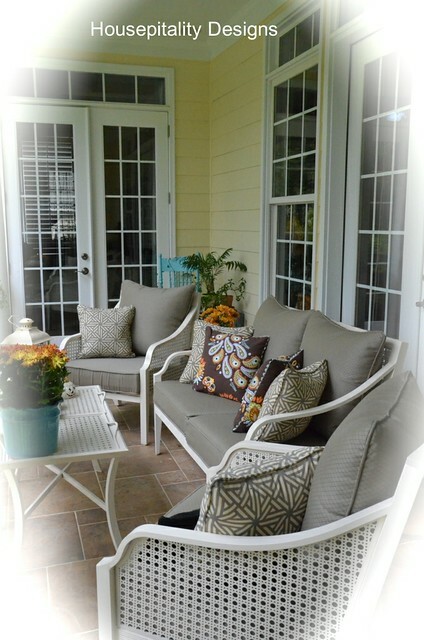 Shirley it is a perfect Autumn decor, not too fussy and I adore the use of pillows always! I’m still chuckling over the white spray paint spot in the yard! That runs my husband crazy, and he isn’t easily annoyed, and yet, I continue to NOT use a drop cloth either and paint away! ha! The bad thing is, our guest (friends) always come to our back door through the back yard, where I do my best painting! 🙂 Oh well, enough about that! …Your porch looks amazing! I love the pillows! The furniture is really pretty! And your touches of orange are the perfect touches for Fall! I could use a gallon of Botox. Sign me up! weather! Grass grows, husbands get over our antics, life is wonderful! Love the pillows! I feel for you with the white grass. I did that at my beach house painting an iron mermaid turquoise, and it got on my concrete porch. In fact it’s still there. You should buy a can of dark green spray paint! ;o) My husband would be witchin’ if I did that, too! Men are psycho about some grass, aren’t they? Beautiful — of course! I am in love with that felted pillow — truly a one of a kind! Really pretty Shirley! I love, love, love your felted pillows. I agree that they are beautifully crafted. Hope you have many more nice days to enjoy your porch! Love the appliqued pumpkin pillow and your lantern, Shirley! I have to keep my eyes open for clearance sales on those. They really lend themselves to decorating all year long. Seeing your porch makes me want to get right up, fix a cup of coffee, grab a good book and sit there for hours. Delightful! 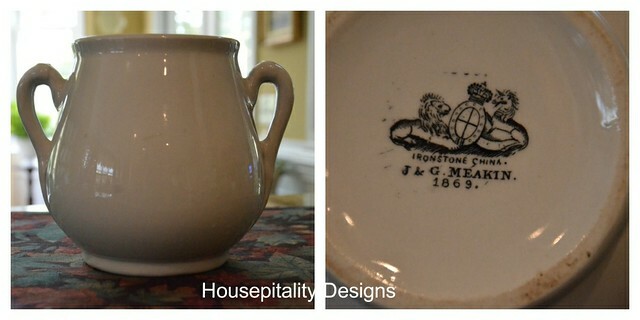 I really want an ironstone container like yours; that was a great find! 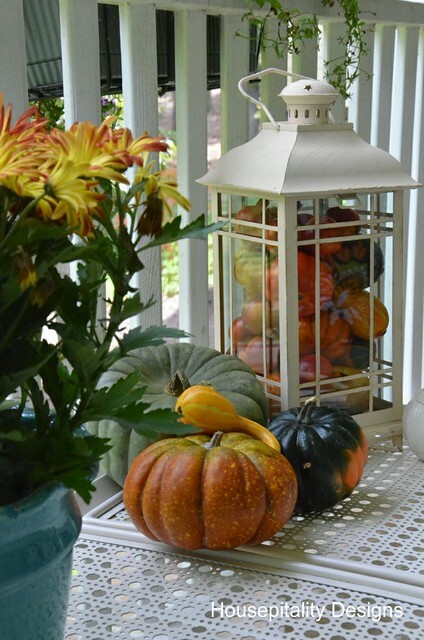 Your porch looks wonderful dressed for fall! I love those discounted pillows from JoAnn’s (I might have to swing by our JoAnn’s today :D), but your felted wool pillow is the best. Don’t you love when you find something so unique for such a great price? Everything on your porch looks perfect for fall, and I’d love to spend the afternoon there on a gorgeous day like we had here yesterday. Looks a bit on the cloudy side today. Your porch is very lovely and so welcoming! Looks great. Love the pillows together! And love your white ceramic pumpkin. These pictures took my breath away. I love all the touches on your back porch. The pillows and pumpkins are fantastic!!! Love the laterns too. beautiful, Shirley…Wow, what an eye you have for flair! When can I come over, it is just gorgeous! I could spend hours on your back porch it is so beautiful! Love your fall pillows. The spray paint incident cracks me up! I spray in the garage, and there are patterns in every color on my garage floor. It almost looks like a Jackson pollock painting and I’ve even had people seriously ask me if I designed the pattern! 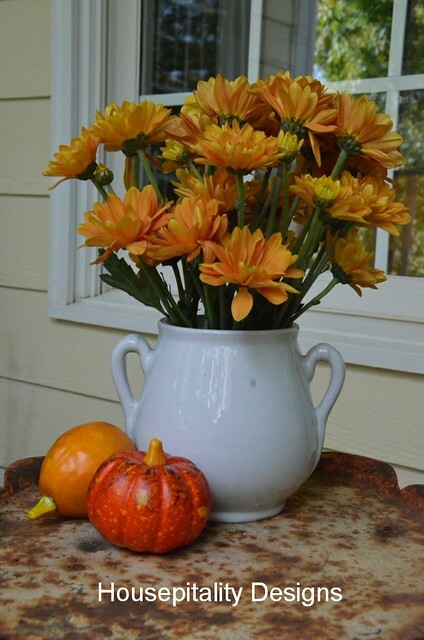 I love your Fall decorating, especially the new ironstone container! So pretty! 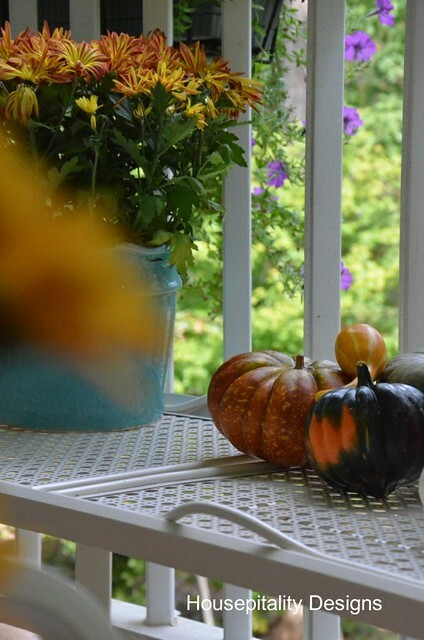 Your porch looks wonderful…not too much to overpower the fall color that should arrive soon. It looks like the perfect spot to sit with a magazine, a Pumpkin spice latte, and enjoy the cooler temps. Hi Shirley! I have loved seeing the photos of the Southern Blogger’s Conference… I wish I would have gone!!!! You last post was so much fun! It is amazing what a little touch of fall color and a few fabulous pillows will do to makeover a space for the fall season! LOVE your upper porch!!! Great furniture and what pretty fall decor! You must love being out there! LOL … we had a blob of spray paint snow in our yard earlier this summer, too! I was tempted to get green spray paint to cover it up! Your porch is beautiful, Shirley! 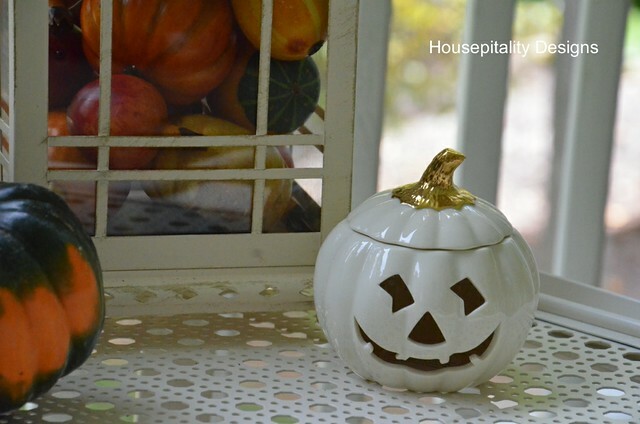 I love the pillows … the lantern … and, the cute Lenox pumpkin! I’d love to enjoy coffee or cocktails out there … such a great view, too! Love seeing “our” furniture all decked out for fall! That ironstone is fabulous – makes me wish even more that I had been there for the thrifting outing – next year! I love your pillows. 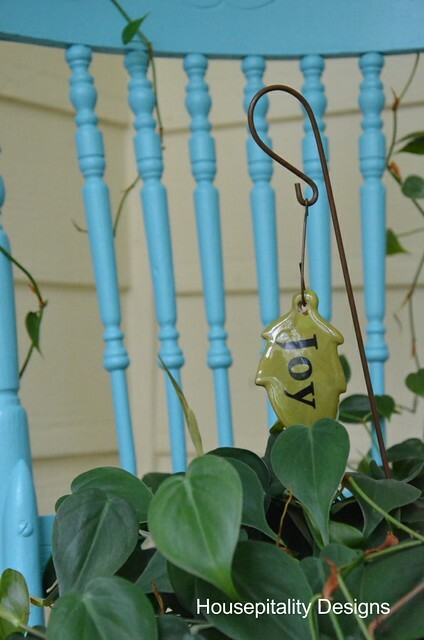 Sooo perfect for your porch! Very nice! I love your decor! 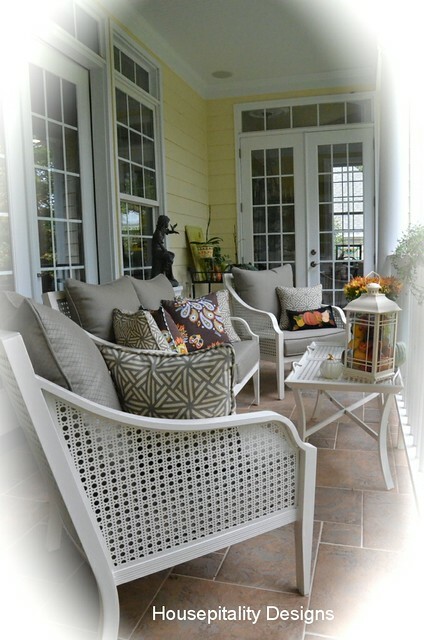 Who wouldn’t love to sit out there on your beautiful porch and sip some hot apple cider and look at holiday magazines? Sound tempting? I love the furniture set you have out there and just adore the little hand crafted felt pillow! Don’t feel too bad about the white spot in the yard either. I once spray painted in my garage and some of it got on the garage floor. Now, everytime my husband sees it, he always “reminds” me of it. Ha! At least, yours will eventually go away. Your porch is beautiful in any season. I love the Fall touches. Thank you for linking to the Open House party. Shirley, you are too funny! I will have to admit that I have painted grass, too! Love, love, love that felted pillow! Love how pillows can change the look so easily ~ yours are perfect, I’d love getting the felted one out every year! What a pretty spot for you to sit and enjoy the changing scene! I am loving on that felt pillow and will try to make one someday. Every thing looks beautiful and inviting for the season.